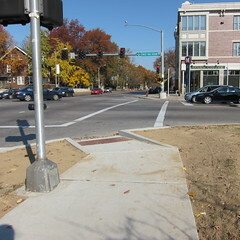 Back in November, construction workers redid the curb ramps at the intersection of Skinker Blvd and Forest Park Pkwy. The reasoning for this work is mysterious—the insersection was completely redone only a few years before as part of the Cross County MetroLink project—and resulted in no noticeable improvement, whatsoever. In fact, construction may have made the sidewalk situation in the southeast corner of the intersection worse than before. Almost every day, hundreds of Washington University students walk and bike across 2 sides of the intersection on their way between the Skinker/DeBaliviere neighborhood and the university’s Danforth Campus. The pedestrian volume often results in groups of 4-10 people gathered in the northwest or southeast corners of the intersection waiting for traffic signals to change. Prior to construction, the curb ramp in the southeast corner of the intersection had flared sides than effectively widened the sidewalk at the corner and provided more space for pedestrians to stand. While the sidewalk inadequately accommodated the pedestrian volumes it saw, it still served its purpose. After construction, the brand new sidewalk looks almost the same as the old sidewalk except for the removal of the flared sides. With its hard surface area reduced, this sidewalk corner is now completely unsuitable. On a typical morning, it is a common site to find pedestrians crowded on the curb edge or in the grass. Bikers who have no space to turn around on the sidewalk, now just remain in the street hugging the street edge. Looking at the results of construction, it seems obvious that no thought went into the needs of non-drivers at this intersection and that a standard sidewalk template was the only design considered. The standard sidewalk design, however, has made this intersection slightly dangerous to pedestrians and bikers. At the very least, the southeast corner needs to be redone by greatly expanding the area of the sidewalk and installing two curb ramps. That way, anyone who uses that corner might have some place to wait. Thanks for this writeup. The intersection is horrible and was made worse by the November "improvements." It takes several minutes for the pedestrian lights to cycle due to long green lights on FPP and then relatively long green turn lights. Further, the pedestrian signals are the old "flashing hand" type with no countdown or indication when motorists are going to slam on the accelerator with no regard to pedestrians. This intersection (from a pedestrian perspective) is more important than ever and growing in importance. It deserves improved pedestrian amenities and crosswalks/curb ramps. With the new Engineering complex being built (SW corner), relatively new restaurants and university offices (NE corner), connection to Forest Park (SE corner), connection to off-campus housing (mainly to the NE), and Metrolink ramps (SW and NE corners) this intersection is of vital importance to WashU students, staff, and visitors alike. It serves as a vital connection between WashU, Forest Park, residential areas, and popular restaurants. To give it such pathetic treatment is an embarrassment for the city of St. Louis and its streets department. We expect and should demand better. Well said! Here! Here! Two! Two! Two! Why on Earth have we pushed the waiting area off the curb into traffic all over town? This is also true around the BJC complex. I assume we have made the crosswalk box smaller with it's corners at the curb instead of on the sidewalk in order to give cars an extra four feet of sight lines and to save on concrete by pouring one ramp instead of two. It's absurd, and it has to stop. STL Sidewalkers Unite! We must stop this stupid design from being installed all over town. Rally around the 14th Street Mall where the only sensible crosswalks can be found.Two ramps is the obvious and sensible thing to insist on. Well stated, yes STL Sidewalkers Unite!